Tuscaloosa, Alabama (CNN) – The Rev. Kelvin Croom walks down the hall toward the sanctuary his father built 30 years ago with the help of legendary Alabama football coach Paul “Bear” Bryant. “Just glad to be alive,” a deacon says. “I know what you mean,” Croom responds. With its painted cement block walls and low ceilings, the hall has the feel of a locker room corridor. In rooms off the hall, church members rummage through debris, trying to salvage anything they can. Windows shattered when the tornado hit. The roof of the fellowship hall upstairs blew off and crashed into nearby homes. On Easter Sunday, three days before the tornado struck, Croom preached of salvation, of the need to rebuild one’s life, of finding hope even in times of desperation. The rejoicing and the stomps of feet had the pews bouncing. The place oozed with love. So many people packed the church they literally filled the building to its rafters, with people standing all the way upstairs in the fellowship hall. Back in the church for the first time since that service, Croom steps through the doorway into that sacred spot, the sanctuary of College Hill Baptist Church. His voice draws to a hush. The crimson carpet, the pews with their crimson cushions, the stained glass windows – everything is untouched. “In here, you’d have no idea anything happened,” he marvels. On April 27, a mile-wide tornado tore through Tuscaloosa, one of nearly 200 twisters to strike the South as part of a record storm. Hundreds died, including dozens in this college town – many of whom lived in the area known as Alberta City where College Hill Baptist sits. The church lies at the center of the damage, as well as at the crossroads of faith, football and Alabama history. In a community where gospel and gridiron are interwoven like a hand-stitched Southern quilt, it all comes together at College Hill Baptist. The building speaks of history, of a unique bond between two men – one white, one black – at a time when there were few such relationships. While Bryant is revered like no other, it’s Croom’s father, the late Rev. 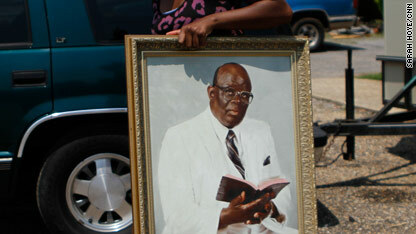 Sylvester Croom Sr., who stands as a pillar of the African-American community in this part of the state. As a young man, the elder Croom couldn’t attend his hometown college. He couldn’t even step foot into the University of Alabama stadium. He’d stand outside the gate to watch games. Eventually, though, he became spiritual adviser to Bryant and two other Crimson Tide coaches. He would come to grace the sidelines for years, decked out in his iconic white suit and crimson cowboy hat and boots. 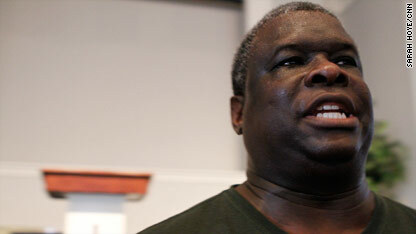 When the elder Croom was starting the church in the 1970s, Bryant gave him a PA system. He gave the pastor money, too, sometimes thousands in cash, sometimes hundreds. “Whatever Dad needed,” Kelvin Croom says. Kelvin and his brother, Sylvester Jr., were among the first African-American football players at Alabama. And when Gov. George Wallace apologized to Tuscaloosa’s African-American community for his staunch support of segregation and for barring blacks from entering the university, he came to the Croom family. “Will you forgive me?” Wallace asked. 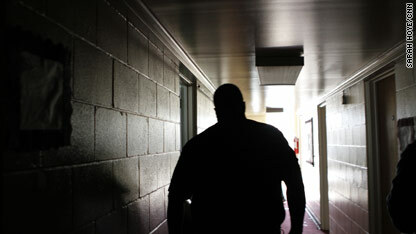 Today, Kelvin Croom surveys the damage outside the church. The parking lot is littered with lumber strewn from homes, roofing tiles and other debris. With the second story gone, he’s not sure the building can be salvaged, even if the sanctuary is OK. 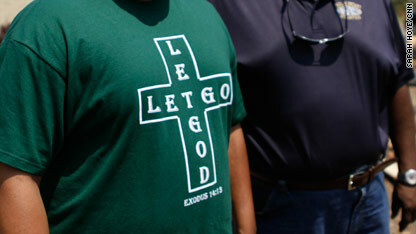 Behind him, a smashed church sign leans to the side, almost like a crooked cross. Two plaques remain intact: one honoring Bryant; the other honoring the elder Croom. “We were taught by my dad and we were taught by Coach Bryant, when situations come into your life, obstacles come, then you have to be strong,” Croom says. He gives a soft holler: “Roll Tide,” the beloved chant of Alabama fans. Across the state, people are mourning. The loss of life and property is indescribable. Thousands of houses across Tuscaloosa alone are damaged or destroyed. Scores of people remain missing. In the fall, they say, the sanctuary on Saturdays is Bryant-Denny Stadium, where more than 100,000 fans gather in the heart of campus to cheer for the Crimson Tide. On Sundays, the place of worship is any of the hundreds of churches throughout this thick Bible Belt region where Saturday’s chants are replaced by prayers and gospels. It’s why a chemistry professor from Germany says, “The holy man in Alabama is not the pope. It’s Paul ‘Bear’ Bryant.” Outside Croom’s torn up church, a military policeman put aside his allegiance to cross-state rival Auburn University to protect the property from looters. Terry Jones is the legendary noseguard who played for the Crimson Tide in the mid-1970s and went on to play for the NFL’s Green Bay Packers. 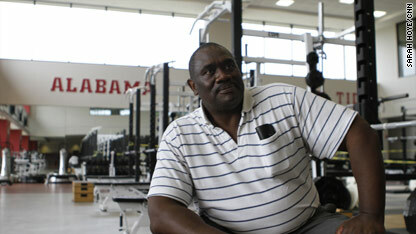 Now a strength coach at Alabama, Jones was in the team’s practice facility when the tornado ripped through Tuscaloosa. An announcement came over the PA system for everyone to take cover. He rounded the corner into his office. 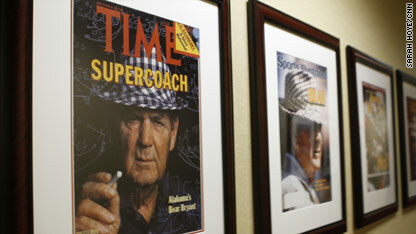 On his wall, Bear Bryant looked down. 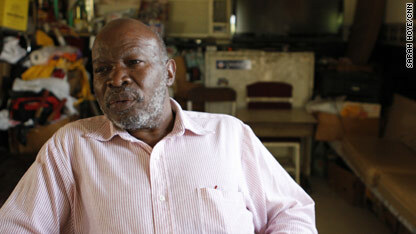 Jones stared back at the man who shaped his life, one of five mentors who molded him. “Where you thinking of going to school?” Bryant had asked him on a recruiting trip. “South Carolina,” Jones told him. Jones became an All-American playing for Bryant. Yet, he says, he also owes much of his success to another man: the elder Rev. Croom. Jones, who started playing for Alabama in 1974, remembered a story he heard from his older teammates. In 1973, the Crimson Tide was about to play Notre Dame in the Sugar Bowl. The black players for both schools planned to sit out the game to send a civil rights statement across the nation. Bryant phoned his spiritual adviser: Get to New Orleans and mediate the situation. The Rev. Sylvester Croom gathered the athletes. All that went through Jones’ mind as he hunkered down in his office, the storm overhead. The 6-4, 320-pound giant owed his life to both those men. If the elder Croom hadn’t given that speech to the black players who preceded him, his career could have been over before it started. If Bryant hadn’t switched him to noseguard his senior year, he might never have starred with the Packers. Bryant made his players attend church. He ingrained it in them: Football and faith help shape a boy into a man. Jones now serves as a deacon at College Hill Baptist Church. Life has been good to him, thought Jones, a small-town boy from Sandersville, Georgia, who broke racial barriers and crushed many a lineman along the way. Jones braced for the worst. The wind whipped outside. The tornado missed his building. Clee Greene no longer walks with that pep in his step from when he first arrived in Tuscaloosa in 1960. He got off the back of the bus from Louisiana with a “dollar and quarter” in his pocket and has never looked back. He’s now got a bridge named after him in Alberta City. While Bryant brought black players to Tuscaloosa to play football, it was Greene who helped shape them into men. The barber on the other side of the railroad tracks would sit the young kids in his chair and preach to them about life and love, God and unity. Electricity poles snapped with gigantic flashes. The tornado screamed, and his house shook. “A train is coming in,” his granddaughter said as they huddled in a hallway. “That’s not a train,” he told her. Remarkably, his house is one of the few in Alberta City that wasn’t harmed. He runs his barbershop out of his house. He gives away more haircuts than he sells. What sustains him now amid such destruction? Faith for one, he says. The other? Well, Greene decides to demonstrate. He leaps from his barber chair and searches through his belongings. 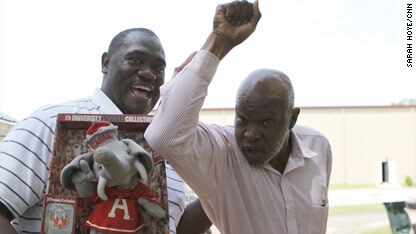 He pulls out a stuffed elephant, the Alabama mascot known as Big Al. He presses a button. The elephant grinds its hips to the tune of the Alabama fight song. Greene places his nose to his shoulder and throws his arm into the air, like it’s an elephant trunk. With Terry Jones at his side, Greene begins to belt out that iconic chant. The legendary noseguard joins in: ROLLLLLLLLLLLLLLLLLLLLL TIDE ROLL! Standing at the altar on the Sunday after the storm, Croom dabs the sweat from his brow with a white coach’s towel. Dozens in his flock lost their homes when the tornado gutted Tuscaloosa. Many lost friends and loved ones. Tears and hugs, singing and rejoicing punctuate the service. The University Church of Christ volunteered space for members of College Hill Baptist to worship. The congregants pause. They share hugs and pleasantries. “Our community has been devastated, but God still lives,” Croom says. The pastor calls everyone to the altar. More than 200 people huddle together. Some place hands on shoulders; others hold hands. “Some will say the church is over there,” Croom booms, pointing toward the tattered building across town. Croom implores the congregation to volunteer, to help thy neighbor. The church was planning a complete renovation before the storm. Maybe, Croom says, the tornado is a warning to be careful what you ask for. Now, they have no choice but to rebuild. CNN’s Sarah Hoye contributed to this piece.